Vegetarians should look away now. ‘Cocido’ is the ultimate homage to pork meat and a classic dish this time of the year, where a variety of pork meats is boiled with vegetables and chickpeas or potatoes. Lalín, on the last section of the Vía de la Plata Camino de Santiago route, is Galicia’s ‘Cocido’ capital. The town’s Festa do Cocido (Boiled meat Festival) takes place until 23rd February. Another meaty festival along the Camino de Santiago takes place in A Fonsagrada, on the Original Way, on 22nd and 23rd February. Feira do Butelo is another gastronomic fair honouring a local speciality, this time the classic mountain cured meat ‘butelo’. Carnival is a last blast of fun and games before the frugal Lent period. This fun-loving and indulgent festival is called Entroido in Galicia and it is widely celebrated in villages, towns and cities. It is time to mock authority, welcome Spring, enjoy ourselves and eat plenty. Pork dishes including the famous ‘cocido’, as well as various cakes and pastries are the food of choice: not only pancakes but also doughnuts called ‘roscas’, ‘orellas’ (ear-shaped pastries, also called priest ears!) and many other deliciously sweet treats. Entroido takes place this year from 27th February until 4th March, which is Pancake Tuesday (called Martes de Entroido). 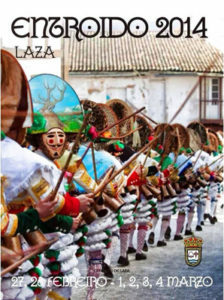 The most unique and ancient Entroido festivals take place in the province of Ourense, in Verín, Xinzo de Limia and Laza. Laza is on the Vía de la Plata. Oviedo, on the Original Way and Northern Way, also celebrates its Carnival festival, on 24th and 25th February. As well as many towns and cities across Spain. The market town of Arzúa, on the last section of the French Way Camino de Santiago, pays homage to its most famous produce this month: cheese. 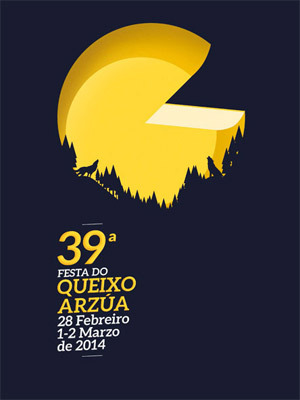 From 28th February until 2nd March, Arzúa hosts the 39th edition of its cheese festival, showcasing many cheese producers from the region, as well as offering visitors two days of good music. A perfect stop for cheese-lovers. The city of Ferrol, starting point of the English Way, hosts its traditional night dedicated to serenading the ladies, called Noite das Pepitas. Since the XIX century, local male choirs stroll around the city centre serenading the ladies one night in March. Women come out to the balconies to listen to their songs. If you are in Ferrol for the festival, you should also try the traditional cake called Pepita’s kiss, ‘bico de Pepita’. *You might also like to read: 10 must-see Camino festivals in 2014.